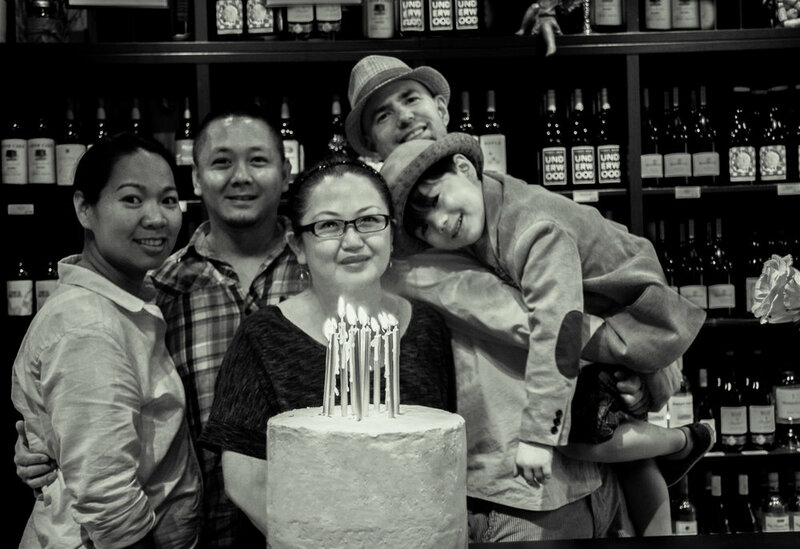 Celebrating over 32 years as "A shop for wine lovers"
It’s a phrase that has been under our name for decades now. But it’s more than just a slogan—it has been our defining philosophy since we opened our doors over 31 years ago. We love what we do, and we love providing a gathering place for friends and neighbours who share our passion for the life-enhancing qualities of a good glass of wine. Our selections come from all around the globe but our heritage is pure Vancouver—family-owned and community-minded. We were one of the first private wine stores in BC when we started back in 1986, a genuine mom-and-pop operation (with help from grandparents, aunts, uncles, and kids), and we're honoured to say we've grown up in the neighborhood. Today, the next generation of family owners, for whom the wine shop was a second home, are bringing their families into the business too. We are continuing and expanding the tradition of local family ownership, with deep roots in the community, and we are continuing the tradition of bringing a world of wine home to Kitsilano. Not only that, we’re always looking to share some of the more interesting offerings from artisans close to home. Not just winemakers, but specialty cheesemakers, confectioners, chocolatiers, cookbook authors—we have made it our mission to make our little shop a home to those who are passionate about the finer, and tastier, things in life. At the same time, we are not an “exclusive” wine dealer. We want to bring this passion for pleasure to everyone. At the Broadway International Wine Shop, you'll find something for every taste and every budget. You'll find exotic specialty wines. You'll find innovative releases from smaller boutique producers. You'll find the right-priced bottle for that backyard barbecue. You'll find new discoveries at our weekend tastings. One thing you won't find, though, is an attitude. Because to us, good wine is not about snobbery—it's about sharing a passion for all the good things in life that are worth raising a glass to. That’s what we have been about, since 1986. A place where you can gather with friends and discover the best that is on offer from around the world and down your street. Whether you are a serious collector looking for an exciting special vintage, or a casual imbiber looking for just the right bottle to uncork with some pizza, we are here to help. What’s more, we are neighbours. The Broadway International Wine Shop is not a franchise. There is no out-of-town head office. We are local, independent and family owned. We have been a part of the fabric of this community for decades and we are proud to say we have earned the right to use that phrase we display under our name. If you live in this area and love wine and care about supporting neighborhood family businesses, this is your home too. In Vancouver, we have been, and always will be, a shop for wine lovers. Random pics from around the shop from the last 30+ years! Sign up to receive Tasting Announcements and updates.